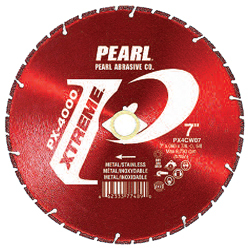 PEARL XTREME™ PX-4000™ is a revolutionary line of diamond wheels for metal applications. It is designed to cut metal, stainless steel and a variety of ferrous metals with less odor and debris compared to conventional abrasives. The Pearl XTREME PX-4000™ is engineered with a high concentration of diamonds with an extremely strong bond. 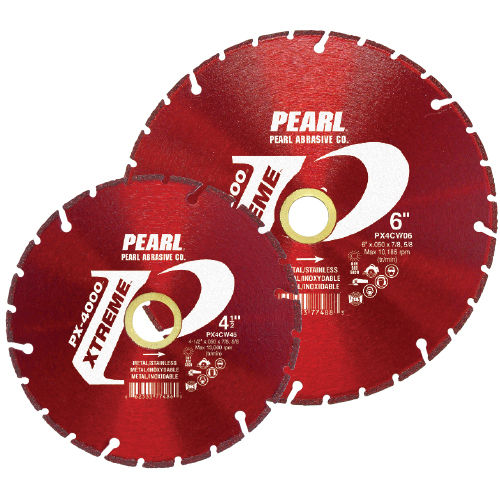 The PEARL XTREME™ PX-4000™ features fast cutting speed compared to conventional bonded abrasives and much longer life. It is extremely efficient because it reduces the need to change wheels frequently, which increases productivity dramatically. In addition, the shape of the wheel does not change over time; therefore, the depth of cut remains the same from the first cut to the final cut. Ultra-thin kerf – Cuts extremely fast. Vacuum brazed technology – For extra long life. Maintains blade diameter – For consistent cutting depth. Fewer blade changes – Less downtime. Less dust and debris than conventional abrasives.